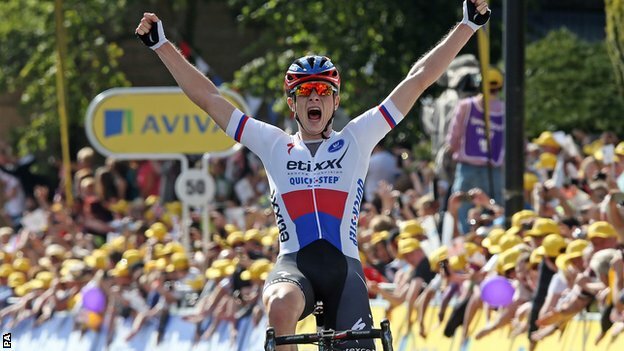 Peter Vakoc won the second day of the Tour of Britain, taking the leaders jersey back to Etixx after a disappointing first day when Cavendish was pipped on the line. The day began in sunny Clitheroe with the ominious climb of the category 1 Nick O’Pendle coming just 30km into the race. The breakaway was unable to get away before the climb and the peloton sumitted it together with Ian Bibby (NFTO) leading the way. After a rapid descent and the first sprint – taken by Lotto-Soudal’s Pim Ligthart – Pete Williams (ONE Pro Cycling) and Alex Dowsett (Movistar) made a bid for freedom and were able to get a couple of minutes on the peloton. Their advantage reached 4′ at one point but Team Sky were keen to bring Dowsett back so worked the peloton hard to reel them in. When the gap came down to just 1′ Dowsett sat up and let Williams continue on to take the maximum points at the second sprint and so the lead in that competition. Williams’ effort came to an end at the foot of the category 1 Bleara Moor and with the peloton back together Bibby once again took the peloton over the climb. A split in the peloton on the climb saw Viviani distanced whilst BMC pushed on in the front group, causing a second split to occur. BMC’s Stephan Kung attempted to go clear but failed, prompting Danilo Wyss to counter immediately and get a gap. Wyss was joined on the descent by Alex Peters (Great Britain), Vakoc, Alberto Bettiol (Cannondale-Garmin), Wout Poels (Team Sky), Pim Ligthart (Lotto-Soudal), Serge Pauwels (MTN-Qhubeka) and Ruben Fernandez (Movistar). The group’s advantage was significant enough for them to stay away and with Poels in the mix Team Sky were less keen to bring them back which allowed them more of a gap. The eight riders led over the second category Pendle Big End which was the last climb of the day then descended towards the finish. With 19km to go and the break starting to get jumpy with less than 1′ back to the peloton, Vakoc decided to attack and quickly accelerated away from his companions. Despite his gap never being more than 30″ back to the chasers Vakoc was able to maintain his advantage as he wound through the country lanes of Lancashire and took the stage win in Colne.